I really like the introduction when Shi-on (Joo Woo) stood at the Railway Track as he recalled his past when he was a little child. We get to see his difficult childhood and how people around him treated him like an oddball, simply because he could not blend into their world. His Hyung was always helping him to get into groups and even encouraged him to play with his peers. However, Shi-on was in his own world and his only companion was his caged rabbit. It was revealed that Shi-on was diagnosed with Savant Syndrome. 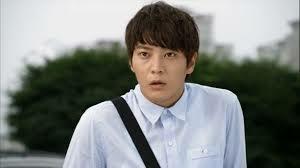 The young Shi-on acted very well and i almost cried when his rabbit died. The other heartbreaking scene was when his father in his druken rage had an argument with his mother regarding sending Shi-on to a special school. The little boy and his brother bonding was so strong and i was touched by those scenes. Tragedy struck next and we saw the two brothers laying side by side at the mine caves. Thankfully, there is someone who believed in him and that person is Doctor Choi who saw his potential in the medical field. He shockingly discovered Shi-on extraodinary talent in memorizing and visualizing the human organs/structures. In the end, he took Shi-on in his wing and nurtured him. 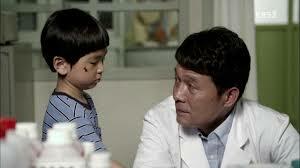 I believe Doctor Choi played a great part in guiding Shi-on towards the medical field. Shi-on looked adorably cute when he can't resist the temptation to watch the 3-D TV. Those Autistic disorder syndrome is still there even when he became an adult. I like Shi-on child like expressions and awkward movements. His acting did protrayed a person with Autism and when he tried to recall his medical knowledge, his expressions was excellent. I know it is a drama but i find it weird or simply doubtful that Shi-on who has autism will be able to perform his duty as a surgeon well. At least not at the beginning, i am certain that the show will plot his growth as a surgeon in the future episodes. Nonetheless, Shi-on managed to rescue the injuried boy and performed first aid to him. In the end, he was even asked to go back to the hospital after videos of him performing first aid on the little boy were circulated in the internet. The herione Yoon Seo looks like a tough nut when she literally curse and swear in her drunken stupor. Interestingly, she mistaken her house to Shi-on house and slept overnight. The next day, she screamed when she discovered a shirtless Shi-on. The other surgeon Do-han appears to be a very difficult and harsh person, I supposed he will give Shi-on a tough time at the hospital.